Just a little something I threw together last night, and it came out fantastic. 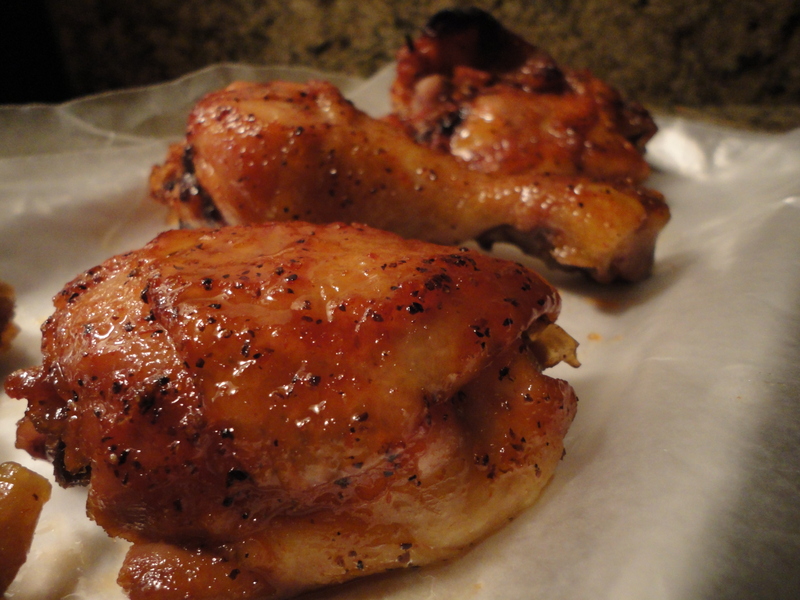 I used chicken legs and thighs because that’s what was in house, but this recipe would also be great for wings! I served the chicken with some Soy Glazed Potatoes that were also delicious… A fun and flavorful Asian-inspired meal that’s super easy to cook and doesn’t hurt the wallet. It really doesn’t get any easier than this… in a large sealable bag combine your liquids, sugar and black pepper, then add the chicken, making sure that all pieces are coated with the mixture. Marinade in the refrigerator for at least 2 hours, and up to 24 hours. Put the marinated chicken in a 9×13″ baking dish and cook uncovered for 1 hour, basting the chicken every 15 minutes with the liquid in the dish. That’s it, your done. Put ’em on a plate and enjoy! Tags: asian chicken, chicken, perfect pairings, perfect pairings at home, spicy chicken, sriracha, wings. Bookmark the permalink.